Don’t have a beer mug worthy of our delicious beer??!! We teamed up with Graffito to remedy that! 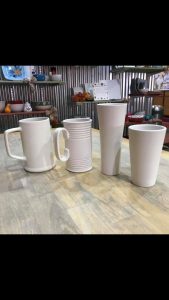 $30 covers your choice of 4 clay mugs to paint/glaze to your liking and a free pint of our beer to spark those creative juices!